Hitting a nasty slice can plague any golfer, and while identifying a bad slice is easy, diagnosing it may be more difficult. Knowing the cause of slice will allow you to fix it, and in this segment of Teaching with Technology, PGA Professional Todd Kolb shows us how weight distribution through the down swing can be a major culprit, and he has the numbers to prove it. PGA Teaching Professional Todd Kolb with another segment of Teaching with Technology. And one of the great things about teaching the game today is the ability to really look deep into what is happening in the golf swing. And today I’m using my Swing Catalyst System, and we’re talking about one of the most common things that happens when golfers slice the ball, which is probably the most common shot as an instructor that we see. So there’s a variety of things that can be a cause of slice, but today we’re going to focus on where the weight is at on the feet. That’s one of the beauties of working on the Swing Catalyst System and technology is I can look exactly where the weight is at on the feet—left or right—at any point in the golf swing. So I’ve got two examples here where I’ve made two swings: one of them was a nice high draw, one of them was a fade. So we’ve got the good swing over here on this side, and what you’re going to see is a couple of things I want you to notice. First of all, I want you to notice where the weight is at on the feet. On this example here, at impact 73 percent—the majority, three-fourths—of the weight is on the lead foot, the left foot. On the ball that sliced, at impact the majority of the weight is on the back foot, or the right foot. I have very little—I have about 38 percent—on my lead foot, and I’ve got almost twice that on the back foot. 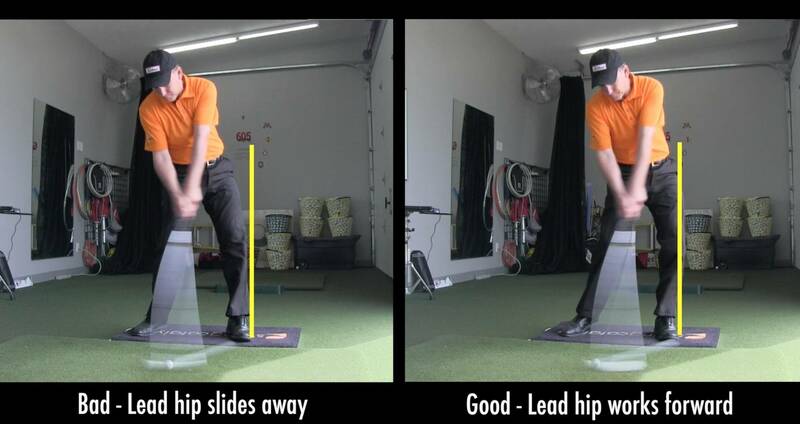 You’ll also notice another common thing that causes this is the movement of the left hip. Over here on the good shot, the left hip is left, noted by the yellow line; versus the on the one that sliced, the hip is working back and away. There is the cause of slice. So if you want to hit a good quality golf shot—if you want to have good, solid contact—you have to have the pressure, the weight, moving left towards the target at impact. It’s that nice, solid left side; that firm left side that we hear about golfers hitting into. This is an easy way to track it, an easy way to look at it (and determine cause of slice if you don’t have a proper pressure shift). If you want to hit a good, solid shot—if you want to draw the ball, have good contact—make sure your weight is moving left towards the target at impact.